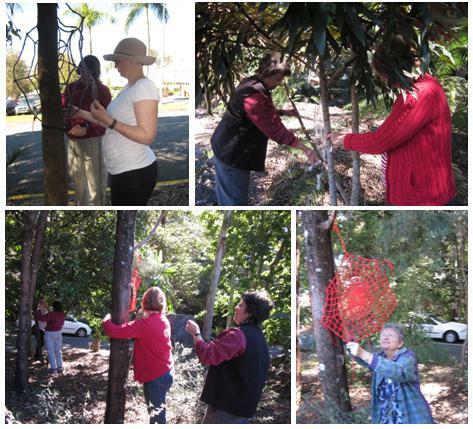 Artist-in-Residence ... Mt Coot-tha Botanic Gardens: ARACHNID ARTISTRY – a different type of website! Gorgeous webs (some with accompanying spiders) now grace the trees near the entrance of the Gardens at Mt- Coot-tha. 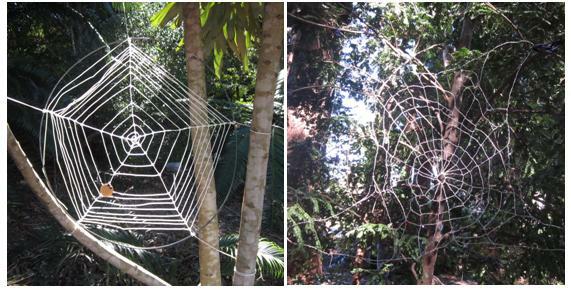 Several months ago I invited my friends (and their friends) to make spiders’ webs in whatever techniques they preferred. I was really thrilled with the amazing response … I didn’t expect nearly so many. I received webs in multiple shapes, materials and colours, and some from people I’d never met. There are several distinct sections …. Some of the makers helped me hang the webs. I hadn’t specified sizes, or pre-allocated particular trees, so I anticipated that we might have problems (or even arguments!) finding suitable places for each to be hung … but it all went well without a hitch, except for some deliberate hitching (of the tethering variety). Thanks Floss, Jill, Nat and Bettina for ‘hanging around’. Of course mine had to have some lettering hanging from it! Then I decided I needed to make a more brightly-coloured one. 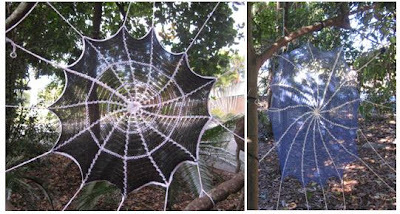 Annette Waraker (from QSWFA - Qld Spinners Weavers & Fibre Artists) really excelled herself and made six webs! They are all really gorgeous – knitted, crocheted and twined in different types of yarns and many colours. She also made some cute spiders as well! 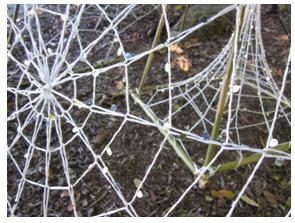 Jill Brose (from QSWFA) and Joanne Jayne (from ATASDA) created these beautifully delicate webs. 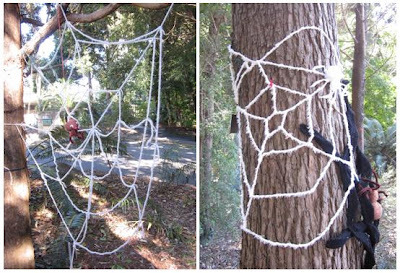 These lacy webs were machine-knitted by Myra Keay and Margy Newman (from QSWFA). 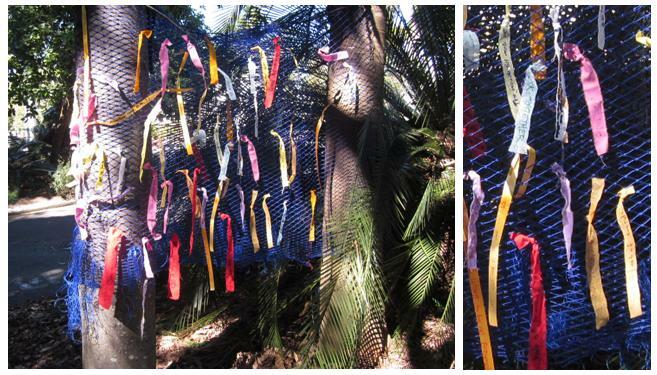 Tess Murray (from QSWFA) and Dorothy Hurford (the mum of Merody from ATASDA) made filmy webs. The Gumdale Group (Mary Kamols, Sharyn Merkley, Jill Glenny, Shane Bailey, Val Zammit and Conchita Hurst) each made a web to complete an eye-catching installation on tree branches. Lorraine McAlister and Ailsa McEvoy (from Scattered Arts) used their crocheting skills to great effect in their webs. This wondrous purple web, machine knitted with a hand-knitted centre, was made by Joan Apthorp (from QSWFA). It is hanging on the outside wall of the bus-stop. 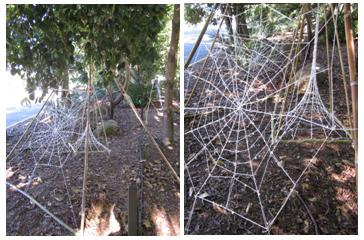 It was a great privilege to be able to include webs made by Jude Skeers. Jude is an internationally-recognised ‘knitter extraordinaire’ and ‘web-master’ who has installed webs in many locations throughout Australia. For this project he collaborated with Peter Wojciechowski, respected bamboo artist, to create some amazing sculptural installations. Jude and Peter went to great lengths (and heights) to install the webs! The stunning installations further up the road (in the area marked with the green spot) are receiving widespread praise. This triangular frame with its funnel-shaped webs sits shrine-like over the rocks. Vertical funnels hang suspended from the trees. The radiating ribs of the horizontal funnels are so very elegant. 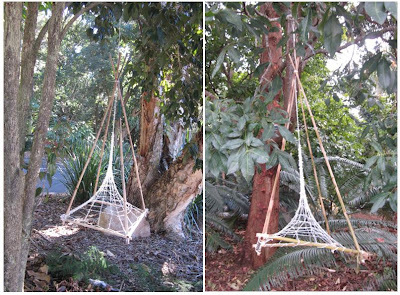 Beautiful webs are suspended from bamboo ‘fishing poles’. The piece de resistance is a striking hexagonal pyramid with webs on three sides and a funnel suspended in the centre. These webs are knitted in sequinned yarn and they are a truly awesome sight as they glisten in the early morning sunlight. 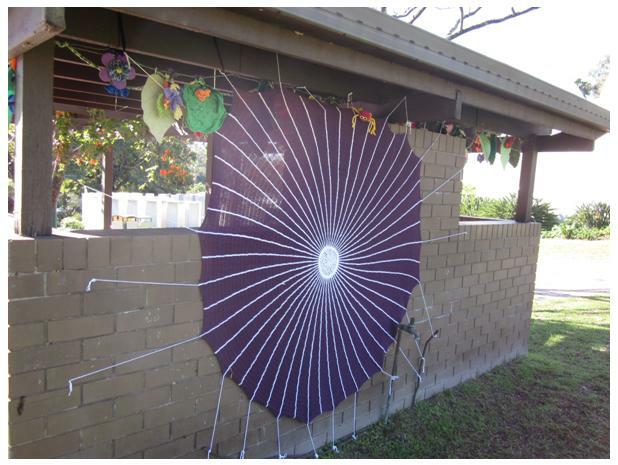 This web project was launched in early August when members of the public were invited to ‘get in the spin’ and weave some magic for themselves. We set up a table under the red umbrella outside the Auditorium. I made myself a web headpiece, and I wore the lovely spider brooch Tess Murray gave me. Lots of people wrote messages on strips of fabric. 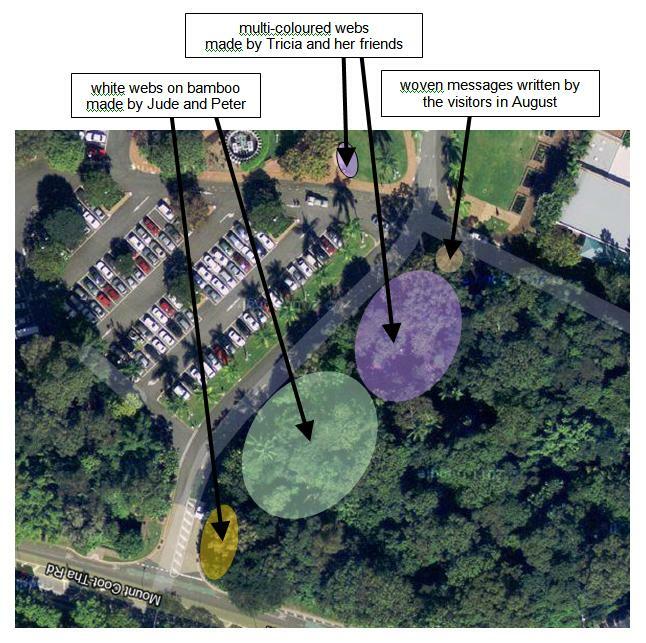 Then the messages were threaded through blue netting to create a community web. It looks very bright and cheerful. Check it our near the large letterbox, just across the road from the Auditorium. Providing they survive intact, this message netting, as well as all the webs, will be left on display until after my exhibition in November (6 - 14). I hope you’ll be able to come to the gardens and check them out. Play a game and see how many webs you can find … and how many spiders!